On a good day, as you stand upon the banks of the Cale and watch the river, you may be blessed by the sight of a streak of blue flashing along the water and soaring gracefully around the nearest bend. 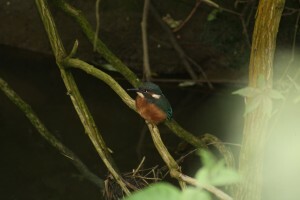 This, of course, is the kingfisher – one of the best loved and most recognisable of Britain’s birds. The kingfisher nests along the banks of still or slow-flowing water, and are best seen when perched on a branch overhanging the river, waiting their chance to pounce on a passing fish. They will also supplement their diet with aquatic insects, tadpoles and other small creatures. There are approximately 4,500 breeding pairs of kingfishers in Britain, where they thrive, but the population has been falling in continental Europe and they remain amber listed. They are particularly vulnerable to changes in environment, because although they breed rapidly, individual birds rarely live more than two years, with about three quarters of chicks failing to reach adulthood and roughly the same number of adults dying between one breeding season and the next. Their prolific breeding enables them to replenish their population quickly if and when suitable habitats are available, but they cannot hunt for food in fast-flowing waters, and their position near the top of the food chain makes them vulnerable to pesticides and insecticides that may build up in the fish population. Polluted rivers also are a no-go area as the fish upon which they prey cannot survive in the poisoned waters. Kingfishers pair up for the mating season in February; if a male and female hold adjoining territories they will often join forces to raise chicks, and then return to individual territories in autumn. The first clutch is laid in late March or early April, and usually consists of about half a dozen eggs, which are incubated for three weeks. Upon hatching, the chicks require 12-18 fish each, per day; however, unlike many species where the largest and noisiest chick hogs the entire food supply, kingfisher chicks tend to feed in rotation, as once fed they retire to the back of the nest to digest their meal, enabling the next chick in turn to move forward and feed. The young birds fledge after about 25 days, although this takes longer if fish have been in short supply; once fledged, their parents will feed them only for another three or four days, before driving them off to find their own territories, and attempting to breed a second clutch; in good years a third clutch is quite possible. 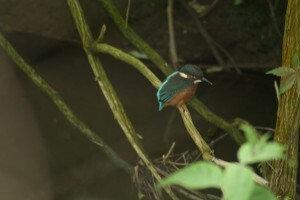 This rapid turnover enables a large number of kingfisher young to be turned loose into the wild; the downside is that many of them are driven away before they have learnt to fish in the wild, and the mortality rate among newly-fledged birds is high. Photograph © Digital Wolf Photography, by kind permission. Kingfishers are very aggressive in the matter of defending their territories, and if one is forced, by loss of habitat or shortage of fish, to move into a new territory, fights to the death between the interloper and the current holder of the area are not uncommon. The average territory will cover at least a kilometre stretch of a river such as the Cale, so there is likely to be only one resident bird in Wincanton, joined by a mate for the breeding season. Male and female kingfishers look almost identical, but there is one distinctive feature – the female wears lipstick! That is, whereas the male’s is all black, the lower part of the female’s beak has a distinctive pinkish-orange tint. Below we have a short video of the kingfisher on the River Cale, taken by our own committee member Steve Lee who was fortunate enough to be able to capture it having a quiet rest on a branch.